CM: The medallions by Ghika are the climax of his production in relief. Ghika recounts: "In 1976 my great friend Tassos Zoumboulakis suggested that I should design six medallions on subjects of my own choosing. I decided on six pairs of lovers, which were struck in gold, silver and bronze, and the dies were then destroyed. 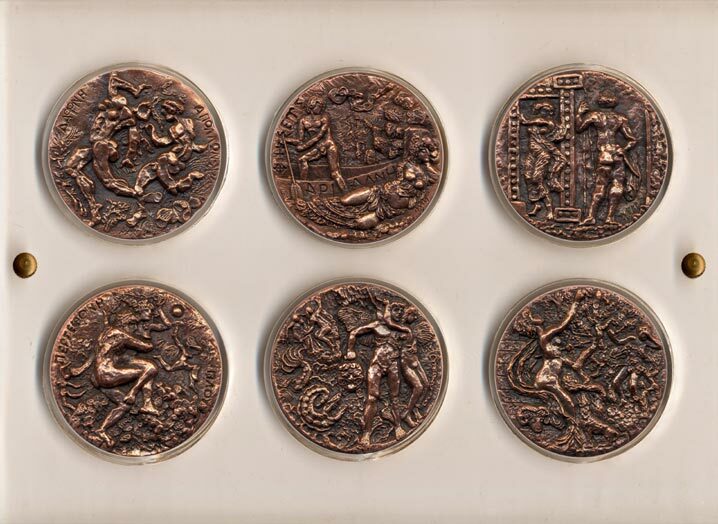 The medallions were cast from the preliminary models, which I made of plasticine, about four times the size of the final medallions." The photographer Alkis Karydopoulos (b. 1950, Turkey, Constantinople) recorded Ghika at work on Apollo and Daphne, the first of the six pairs of lovers [rear cover]. The craftsman in charge of the medallion production was the well-known jeweler Mattheos Armaos (Greece, Athens b. 1932) who cast the series: fifty-nine in gold; fifty in silver; and two hundred and thirty-seven in bronze [E2, F2]. Ghika based his reliefs on preliminary drawings made with pencil and charcoal. An unusual rough sketch [G2] kept at the Zoumboulakis Galleries' archive demonstrates Ghika's attention to the text on the verso of every medallion. The final result is stunning, and no one could have expected the outcome, given that the materials and size of the original vary from the final product. In recreating the myths, Ghika is at his most original. He renders his compositions in dramatically new ways, filtering the myths through his own idiosyncrasy. The result is a timeless 'renaissance.' As Dr. Iliopoulou - Rogan claims, with his Mythical Lovers Ghika managed to revise the very composure, even purpose, of medallions [Iliopoulou - Rogan 1980, p. 14]. Indeed, never have official medallions been more spirited and organic. Owing to the medallions' round shape and absence of a horizon line, the amorous couples set within them seem to be floating anchorless, thus evoking the ethereal quality of figures in Marc Chagall's paintings.